These 30" Raggedy Ann and Andy plush dolls are timeless. 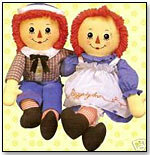 Both have red yarn hair, button eyes and triangular noses and wear their traditional outfits: a white apron over a blue cotton shirt for Raggedy Ann and a flannel shirt, blue pants and a ribbon for Andy. — "Raggedy Ann" was among the popular licensed products mentioned by Holly Reay, owner of Kid’s Corner in Indianapolis, Ind. — "Raggedy Ann & Andy" was also cited as a licensed-toy winner by Melodie Ingwersen, owner of Creative Kids in Columbia, S.C.
— Almost no toy could be more classic than Raggedy Ann, Johnny Gruelle's sweet-natured and moral character from the series of books he wrote for young children in 1918. Supposedly based on a rehabbed rag doll Gruelle created for his daughter, Marcella, Raggedy Ann captured the hearts of a nation. Raggedy Andy joined her advenures in 1920. These 30" versions of Gruelle's characters are a fourth-quarter staple, specialty toy store owners told TDmonthly Magazine, and so have earned a TDmonthly Classic Toy 2007 award.